The avocado (Persea americana) originated thousands of years ago in the southern parts of Mexico, however it was quite some time before it was cultivated. Originally known as the aquacate, the word avocado was not spoken in the English language until the late 1600s. It wasn't until the 19th century that the avocado was introduced to the United States from Mexico. There are many varieties of this nutritious dark green fruit: Zutano, Sharwil, Bacon, Ettinger, Fuerte, Reed, Hass, Pinkerton, and Gwen. Of those cultivars, the Hass avocado is the most commonly grown in California, and it accounts for about 90% of all North America's production. Requiring a subtropical climate with little wind and frost, a single avocado tree can produce hundreds of fruit yearly. This fruit is very similar to the banana in the fact that it matures on the tree but ripens once it is picked. 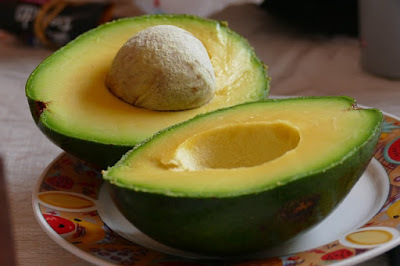 Although an avocado is a fruit, it is not sweet like a fruit. The avocado is high in monounsaturated fat which makes it a great vegetarian food. The flesh of the fruit, once removed from the skin, is soft and has a subtle flavor. An avocado can be used in a wide array of dishes both sweet and savory. Typically the avocado is served raw along with lime or lemon juice, this prevents the fruit from browning. As for culinary uses, the avocado is a very healthy choice for those who are nutritionally mindful. There is no cholesterol or sodium in an avocado, and it has more potassium than a banana. In America, the avocado is generally known as the main ingredient to a popular Mexican dish called guacamole. Consisting of chopped tomatoes, onions, avocados, and garlic, guacamole is the quintessential dip that is served with tortilla chips. Although this is one of the most popular ways to prepare avocados, there are many other delicious dishes and treats that use this magnificent fruit. From simple salads and hamburgers to cakes and smoothies, the avocado is a delicious addition. - This fruit was once considered a luxurious food that was only served for royalty. - The roots of an avocado tree help to prevent erosion by stabilizing the soil. - The avocado is also known as the Alligator Pear. - In California, avocados grow constantly throughout the year. - Almost half of the households in the United States purchase avocados. Check out our trusted selection of the most popular traditional guacamole recipes for the finest in authentic Mexican style offerings. When you need a great dip or entrée topping, search our growing collection of the best in classic favorites and exciting new contemporary guacamole recipe creations.